Getting to and around the Tampa Bay area couldn’t be easier. 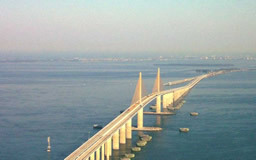 Interstate 275 runs from Tampa south through St. Petersburg and over the famous Sunshine Skyway Bridge. Air travel has played a big role in the area’s history, with the first scheduled commercial flight having taken place over Tampa Bay on New Year’s Day 1914. Tampa International Airport (TIA) is the Bay area’s major airport facility, continually ranking among the country’s best airports. It is served by most major airlines which provide nonstop daily and connecting service to national and international destinations. St. Pete - Clearwater International Airport (PIE), with destinations in the Northeast, Midwest, South and Canada, is a 2,000 acre fully certified facility with ILS-equipped 9,730-foot runway and two 5,500-foot runways. It is home of the busiest Coast Guard Air Station in the world. United Parcel Service, Air Cargo and General/Corporate Aviation are also major activities. Albert Whitted Municipal Airport is a 110-acre facility which handles approximately 80,000 general aviation aircraft operations annually and is the home base to an estimated 185 aircraft. The airport provides various aviation services including flight training, aircraft charter and rentals, aircraft and helicopter maintenance, aircraft detailing, avionics, pilot supplies, banner towing, and sightseeing tours. If you’d rather ride by rail, Amtrak will bring you as far as Tampa. The Auto Train offers non-stop service between Lorton, VA and Sanford, FL, just east of Orlando, about two hours’ drive from the Bay area. There is comprehensive bus service through the Pinellas Suncoast Transit Authority (PSTA), including a St. Petersburg-Tampa commuter bus route. St. Petersburg’s Looper Trolley offers great sightseeing in addition to local transportation. 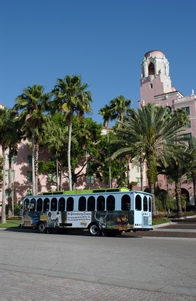 Hop on the Suncoast Beach Trolley and you can explore all of the unique beach communities from Clearwater Beach to Pass-A-Grille.